Let the notebook match your creative individuality. 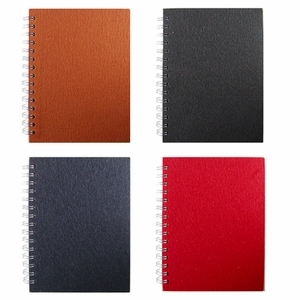 The Verso Design large, wire bound notebook has a 100% wool felt front, and a hard cardboard back and is filled with high-quality blank paper. Verso Design Notebooks are made of 100% wool felt and have been treated with an environmentally friendly finishing chemical. This phase makes the product dirt resistant and prevents pilling. The chemicals used in the dyeing process are all environmentally friendly.